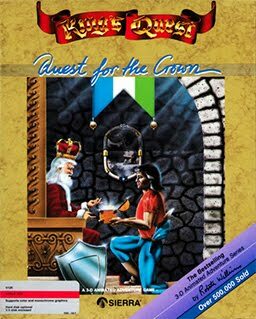 King's Quest: The Quest for the Crown (also known as King's Quest I: The Quest for the Crown) was the first game in the King's Quest series. It was also the first game to use Sierra's AGI engine. This allowed the player to move the character throughout a scene and combined a text parser for actions, which was ground breaking at the time. In this game, Sir Graham is chosen to find the three treasures of Daventry. Once he finds them, he shall become king. The game was released in 1983 as a keyboard controlled graphical adventure game with a text parser using Sierra's AGI engine. In 1990, it was remade as a point-and-click adventure game with remade art in 256 colors using Sierra's SCI engine. Both the original AGI version and the SCI remake of King's Quest are now supported by ScummVM, a program designed to let 2D adventure games run on multiple platforms. With ScummVM, King's Quest now runs on modern versions of windows, as well as Linux, Mac OS X, and many consoles such as Dreamcast, Wii, PlayStation 2, and PlayStation Portable. For a complete list of platforms supported by ScummVM, see here. In 2001, a fan remake was created by Tierra Entertainment, now known as AGD Interactive. It was made with Adventure Game Studio in the style of Sierra's later SCI King's Quest games. It also had enhancements to the interface, graphics, music, and voice acting. AGD Interactive was granted a fan license to create their fan games from the license holders of the Sierra franchises, Activision. Josh Mandel reprised his role of King Graham for this fan remake. This fan remake is available for free from AGD Interactive.